This building is anything but cookie-cutter. 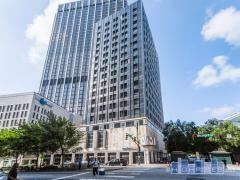 Its unique architecture makes it an easily recognizable landmark of the South Buckhead neighborhood. Located along one of the most prestigious stretches of Peachtree Road, The Barony is ideally located for access to all that Buckhead and Midtown have to offer. Within walking distance to both dining and shopping, the property is also adjacent to Peachtree Heights East Park and "the duck pond" which offers a quiet tree lined walk only one block from Peachtree Street. In addition, there is a gated dog walk area behind the building, a modern exercise room and a private, gated garden area with a grill and lounge chairs. The condos, built in the 1980s, have a lot of character, especially in the arched doorways and stucco construction. Have any comments or questions about Barony on Peachtree? Ask your question and/or share your thoughts about this Building. Have a friend that has been an owner for sometime. Would like to know the square footage? Do all on market now have fire places? Are most residents lock and leave? I am looking for a condo for my daughter. 2 bed, 2 bath. Can you tell me what the HOA fee is and how stable that fee is? Thank you. I prefer email contact.